The extinct mollusks species have left behind their fossilized shells which are now solidified into stones and called Shaligram shilas. 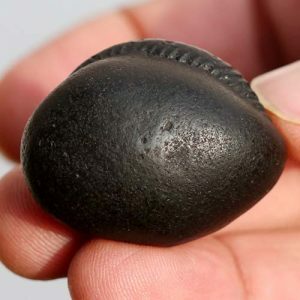 In Hindu religion, Shaligram shilas are revered as different parts of Lord Vishnu; a branch of thought also believes Shaligram shilas represent Lord Vishnu’s principal avatar. Salagram shilas are mostly found in the River Gandaki, a major tributary of River Ganga. Archeological evidences as recorded in the year 1590 said Salagram shilas were also present in the River Son. The holy stone is a spiritual symbol which manifests unusual magnetic and mystical powers. Shaligram shilas or Ammonite fossils are small black colored stones with one or more holes, seldom found in different hues. The spiral groove on the side-walls of the Shaligrams is indicative of the wheel/chakra of Lord Vishnu. Ammonite fossils belong to the Cephalopoda class, around 425 million old, the shape of which varied and evolved into different shapes and sizes over decades and centuries. 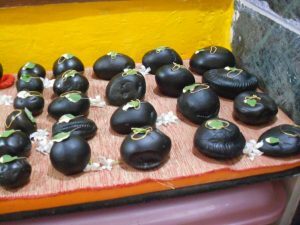 A Shaligram shila is worshiped in Hindu religion with great reverence and spiritual importance. The way a Lingam is linked to the phallic worship, a Shaligram is associated with the yoni (generative symbol). In an official research on Shaligram, a German pandit named Gustav Oppert, had first read a paper in the Congress of History of Religions (1899). 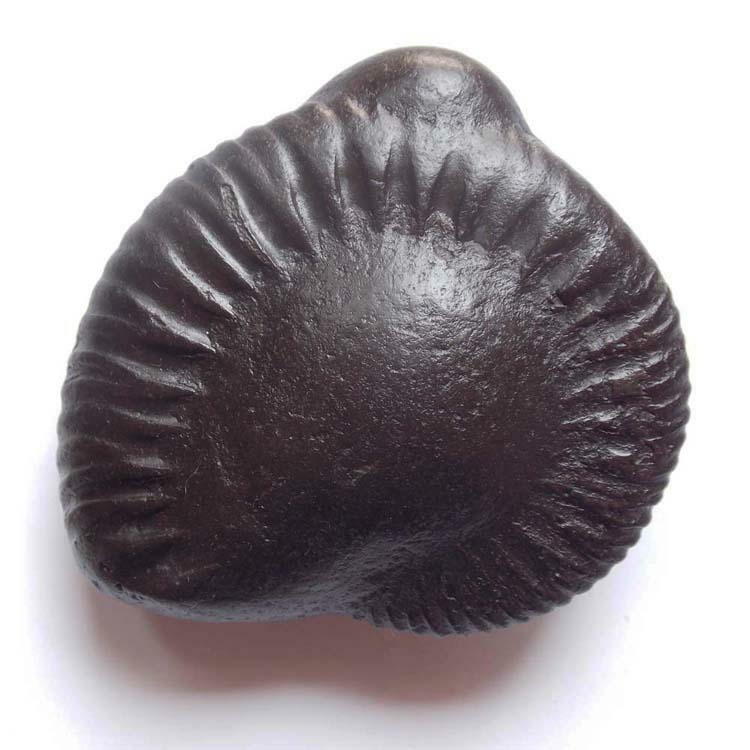 The research attributed the origin of Shaligram worship to the emblem of a female generative principle. Mr. Oppert simultaneously linked the Lingam worship with that of a yoni. On the contrary, Swami Vivekananda, the founder of Ramakrishna Mission and propagator of Vedanta philosophy had snubbed the views of Oppert during a conference on Hinduism. Vivekananda further had said that such theories on Shiva Lingam and Salagram are completely baseless to him. Hobson-jobson, a Glossary of Colloquial Anglo-Indian Words and Phrases, says as per the ancient tradition a Salagram shila can never be inherited by a female child and in case of absence of a male heir in the family it should be passed on to the Brahmins. On the other hand, M.A. Canny has opined that in a male even the worst of the sins could be washed away just by touching the holy water in which the Shaligrams have been rinsed. Again, the Padma Purana, Patala Khanda, chapter 20, identifies the Salagram with padmamrita (the world’s celestial nectar). A drop of Salagram water likens the merits of all tirths and yagnas together. 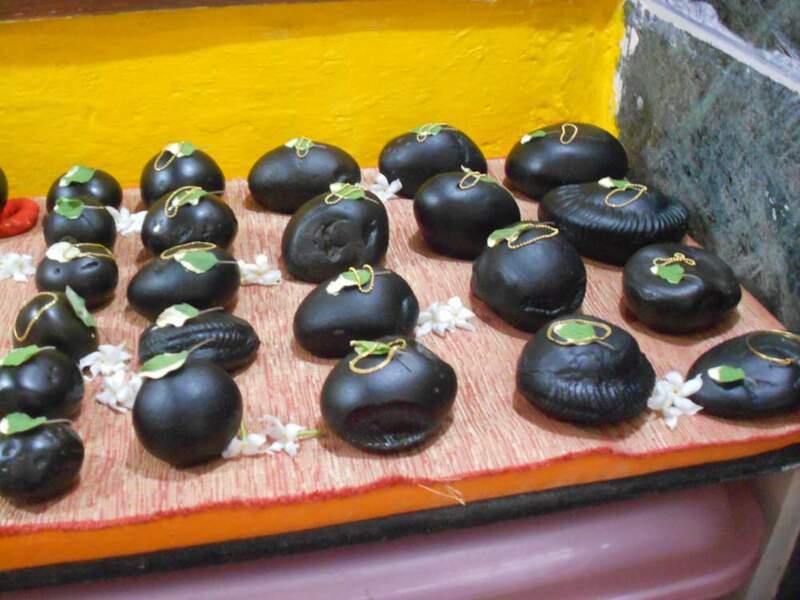 Even today, Shaligram shilas are religiously worshiped in millions of Hindu temple and homes. Dr. N.R. Roy, a veteran Vaishnavite, has even asserted that no Hindu worship can be completed without the worship of Shaligram shilas. Especially, Durga propitiation is definitely incomplete without evoking the Shaligram first. Human wants can basically be of two types- spiritual and material. As mentioned by Tulsi Mahimamritsa, worshiping Salagram shilas directly leads one towards the emancipation from the cycle of life and death. Again, along with the spiritual urge, worshiping the Salagram fulfills one’s material needs as Lakshmi, the goddess of wealth and prosperity, resides with the Salagram. It is important to worship the Salagram along with the Tulsi plant; the man who detaches the Salagram from the Tulsi will be separated from his wife in every birth. There is an interesting legend associated with the origin of Shaligram shila. In the Puranic days, Lord Vishnu had three wives, Lakshmi, Saraswati and Ganga. Once when Saraswati and Laksmi had a terrible fight the former cursed the latter owing to which she turned into a Tusli plant. After this incident, the Lakshmi had to stay on the earth. Amid this chaos, Lord Vishnu appeared and promised his beloved wife, Lakshmi that she would remain on the earth as the sacred Tulsi and would return to her consort after the curse is over. River Gandaki would spring up from the body of Tulsi and obtain the shape of Tulsi. On the banks of Gandaki, Vishnu would remain as a stone idol. Also on the bank would exist innumerable worms with strong tusks and teeth; the worms would pierce the stone idol in the form of a Sudarshan Chakra from which countless Salagrams would emerge. As mentioned by H.H. Wilson, the popular story of Raj Das revolutionised the Shaligram worship amongst the Hindus, especially the Vaishnavites. Following his own dream, Raj Das, a charmer by profession, built a Shaligram shila temple and exalted himself to become the priest of the highest stature. As the news spread about Raj Das’s Shaligram worship, a group of envious Brahmins complained to the King about a non-brahmin worshiping on behalf of a Brahmin priest in a temple. In a series of unfolding events, a fierce confrontation occurred between Raj Das and the group of Brahmins. In front of the King and the whole kingdom, the Salagram idol, along with the cushion, flew and arrived to Raj Das. Perhaps, from this time onward, the non-Brahmins were also allowed to perform worship in the temples and this event also gave boost to the Vaishanvites as Vaishnavism bloomed and thrived throughout the country.